In the Eurometropolis Lille-Kortrĳk-Tournai, there have been proposals to extend the Lille metro across the border into Belgium. Although those proposals have been shelved for cost reasons, I wonder: does any binational metropolitan area have a mass rapid transit system extending into both countries? NB: I'm specifically thinking of metro/underground/subway/lightrail/tram, which are inherent to urban areas. There are many international bus systems both in cities and rural areas and buses do not need any particular infrastructure. Yes - the Basel tram system is mostly in Switzerland but extends into both France and Germany. There are five stations in France and three in Germany. [ÖØ]resund. The Malmö-København binational area is linked by a rail and road bridge. Both the Swedish and Danish railway companies operate trains on this line. The interconnection is complicated by the fact that Swedish trains ride on the left side, Danish on the right side. Strasbourg-Ortenau Eurodistrict, which has cross-border trains: S-Bahn Ortenau + TER Alsace. A PDF with the regional transit map is here. You can see that e.g. bus no. 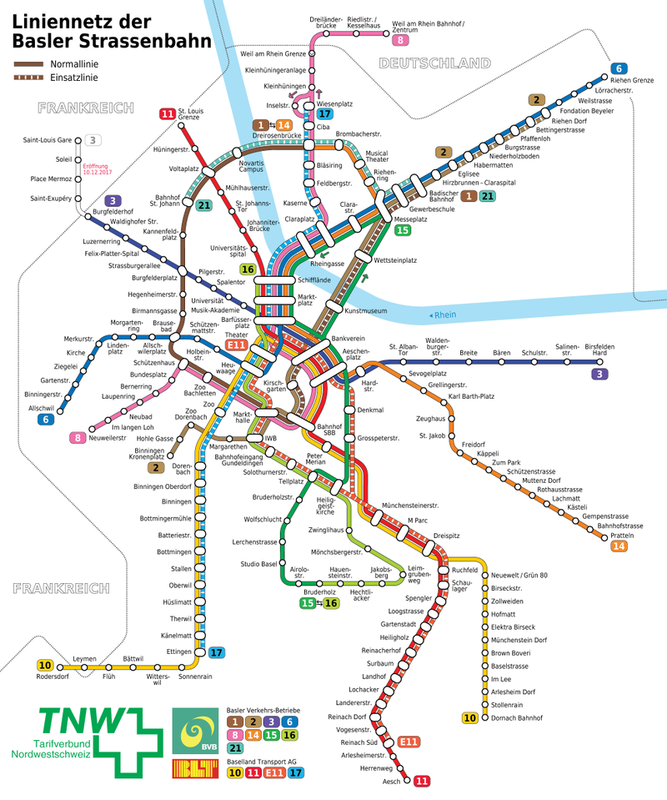 D (in green) connects the two train stations of Strasbourg and Kehl across the river Rhine which separates Germany and France. San Sebastián metropolitan area, which extends to Hendaye, France. One of the lines of Metro Donostialdea terminates at Hendaye's SNCF train station (station Hendaia). Hendaye is too small to have an urban tram/metro system, but is a big train hub. The S-Bahn in Salzburg, Austria extends to Berchtesgaden and Bad Reichenhall in Germany. The Hong Kong MTR subway trains connect to the Shenzhen Metro at Luohu and maybe other stations now. The trains do not go between them, but the border (sorry, "boundary") runs through the station. I think that's about as close as you will get in places with a "hard" border ("boundary"), unlike much of Europe. It was possible to take the S-bahn in Berlin between West and East Germany. I recall a lot of barbed wire at the physical border. The frontier formalities were (IIRC) as you left the station into East Germany. The (planned) Johor Bahru–Singapore Rapid Transit System is perhaps an interesting example outside of Europe. It appears to still be in the planning stage, but at least it seems to be decided that it will be built. According to the plans it will be opened in December 2024. The city buses in Strasbourg France extend into Kehl, Germany. The Tram Line now extends into Germany as well. S-services stop in all stations, RE (RegioExpress) is a "fast regional" train. Bellinzona, Como and Varese are connected to Mendrisio without change every 30 minutes. In the future S30 will terminate at Gallarate and S50 or S40 trains will take its path to Malpensa airport. SSIF (Italian) and FART (Swiss) run allstops and panoramic trains between Domodossola (IT) and Locarno (CH) in a (I think) unique arrangement: two completely independent companies (often knowing almost nothing about the other one's plans...), but tickets emitted by one of them are valid on both (you could take an A/R ticket from SSIF, doing the first trip with FART and coming back with SSIF), and no cash flows between them. Rhätische Bahn runs regional and touristic services between Tirano (IT) and Sankt Moritz (CH). ÖBB (Austrian railways) and FUC (Udine - Cividale Railway) run in partnership MI.CO.TRA. regional trains from Villach to Udine through Tarvisio border. Trenitalia runs regional trains between Piedmont, Alpes-Maritimes and Liguria (Fossano (I) - Cuneo (I) - Tende (F) - Ventimiglia (I)). Due to Piedmont railway ineptitude from 2010 onwards, few trains runs along this route. BLS runs trains between Brig (CH) and Domodossola (IT). Some come from Bern (CH), the Swiss capital. This is a somewhat fuzzy international service, because Domodossola is a border station (with customs), so the line is formally in Swiss, but there are 18 km and 3 stations in Italy before the actual border (and Piedmont region pays for Domodossola - Iselle service). Trenord runs S11 Milan suburban line between Chiasso (CH) and Milan (IT). However in Chiasso station there are "formally Italian tracks" S11 terminates on, so formally S11 trains never enter Swiss. Turin SFM line 3 runs till Modane (F), but again Modane has "formally Italian tracks". Expanding on the Basel Tram Network quoted in another answer, Basel also has a suburban rail network (Region S-Bahn Basel) which spans 3 countries: Switzerland, France and Germany. The main railway station (Basel SBB) has a part that is considered to be in France for customs (and previously immigration) purposes, with regional TER services to Alsace. Some regional services going to Alsace now leave from the regular SBB tracks (including S1). Even better, the Basel Badischer Bahnhof if actually a station operated by german DB, with regional trains operating from there. Lines S6 and RE are CH-DE. Lines S5 and RB are DE only (if you indeed consider Basel Badischer Bahnhof to be in DE). All other lines are CH only. Basel tram, reaching Weil am Rhein in Germany and St-Louis in France. Basel S-Bahn, reaching Lörrach in Germany. Zürich S-Bahn, reaching Lottstetten, Jestetten and Waldshut in Germany. RER Geneva, reaching Bellegarde in France. Milan subruban rail, with line S11 reaching Chiasso in Switzerland. The S11 of the Milan suburban rail service goes to Chiasso, Switzerland. A small historical note that in Berlin there used to be S-bahn (and probably other) links between East and West Berlin. This transport link was an active link between two different countries after the end of the Second World War and before the Berlin Wall went up and communications between East and West were restricted. - Now, of course, the links have been reactivated since the wall came down, but as East and West are no longer in separate countries the modern Berlin transport system is not relevant to your question. The Saarbahn connects Saarbrücken in Germany with Sarreguemines (Saargemünd) in France. There is also a bus line connecting Saarbrücken with Homboug-Haute (Oberhomburg), it was shortened recently because St. Avold does not co-finance it any longer. While not multinational in the strict sense of this word, the Washington DC USA subway (Metro) covers 2 states (Maryland and Virginia) and one state-like entity (District of Columbia). The distribution of stations amongst the states is almost even. I consider this urban multistate subway system very close to "multinational" as: 1. MD, DC and VA have different laws, including those covering mass transit. 2. Funding comes from each entity separate budget, approved by each state legislature. 3. WMATA governing board has representatives from each state 4. US states are more independent then similar subdivisions of other countries. Not the answer you're looking for? Browse other questions tagged trains public-transport international-travel borders or ask your own question.